As part of the Contact Manager app I showed how you can display a paper clip icon in the column of a datagrid to represent documents with attachments. Let's take this one step further and allow the user to download any one of the attachments straight from the view, without having to open the document. 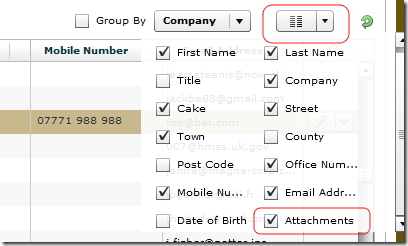 If you enable this column you'll see a dropdown box in the last column of any row that contains attachments. Clicking on a file name will launch/save it (depends on your browser preferences). Not an essential feature in every app but a nice example of something simple to achieve that adds value in certain circumstances. Notice theirs a column of type "download" which has a value of "files" and an attribute called "separator". This tell it to look for the "files" node of each document node and explode it using the value passed as a separator. 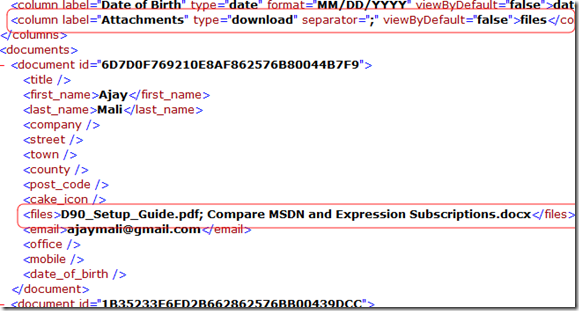 In the XML above it would give us an array of two file name strings - one for a PDF and one for a Word doc. It should be fairly obvious how this XML is produced in a Notes view, no? All quite straight-forward and a quick example of how useful custom renderers can be in AdvancedDataGrids. Not a big fan of using a separator as you never know when it might sneak in. Now you mention it, although I know how I came to avoid child nodes in grid-feeding XML, I'm not sure why I didn't use the format you suggested in this case. The trouble with datagrids in Flex is that a column can't deal with child nodes. Each <document> can only have nodes one level deep if they're to be shown by the grid. I have a draft blog for some time soon about a workaround I came up with related to the above, but, yeah, you're right - it might well be better to use your structure. Like you say the separator isn't foolproof. Great code, like the others... had you think on implement a check box on view to multiple selection (I did) and a multi group collumn ? Have any idea how to save the configuration of columns show or others to don't lose them when run "refresh" ? Congratulations by your family and best regards. 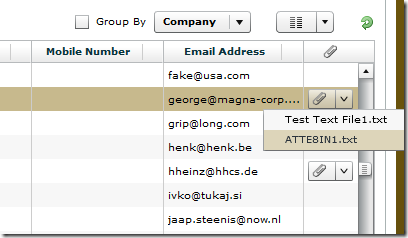 Mutli-group columns should be easy to do. Just add another GroupingField to the array in the ActionScript. Funnily enough I have a draft blog in progress which describes how to remember the column order and visibility. Here are the external links posted on the same day.